A self-professed candyfreak, Steve Almond set out in search of a much-loved candy from his childhood and found himself on a tour of the small candy companies that are persevering in a marketplace where big corporations dominate.From the Twin Bing to the Idaho Spud, the Valomilk to the Abba-Zaba, and discontinued bars such as the Caravelle, Marathon, and Choco-Lite, Almond uncovers a trove of singular candy bars made by unsung heroes working in old-fashioned factories to produce something they love. And in true candyfreak fashion, Almond lusciously describes the rich tastes that he has loved since childhood and continues to crave today. 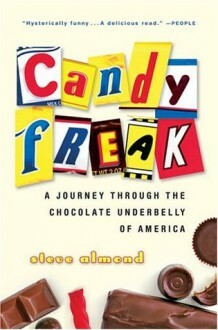 Steve Almond has written a comic but ultimately bittersweet story of how he grew up on candy-and how, for better and worse, the candy industry has grown up, too.Candyfreak is the delicious story of one man's lifelong obsession with candy and his quest to discover its origins in America. if you've ever fell obsessively in love with an idea or a thing, then this is the book for you. it's like a love letter written to candy. absolutely obsessively crazily beautiful.